625 backers pledged $77,820 to help bring this project to life. Thanks so much everyone!!! Late pledging via backerkit will be up on Monday February 12th by EOD. 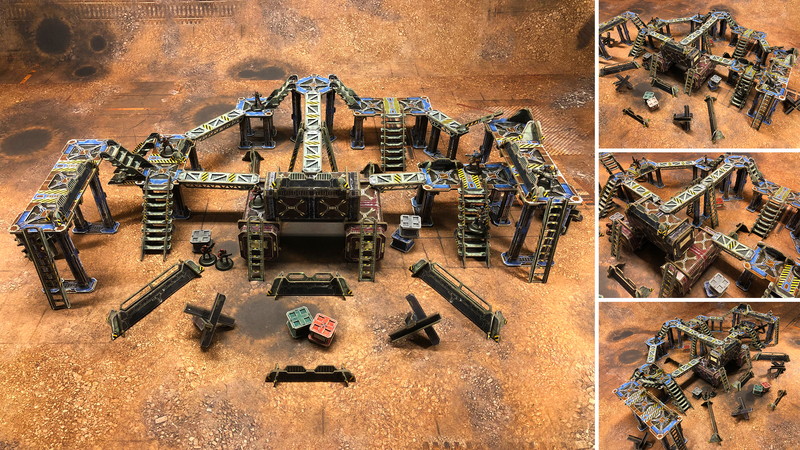 Full color, pre-cut, easily assembled wargaming terrain. Ready to roll. TinkerTurf terrain is two different sets that work together, offered in several different reward bundles. Once you have bought a reward bundle you can also customize your terrain with additional add-on purchases. See the SET DESCRIPTION and ADD-ONS sections below for more details! 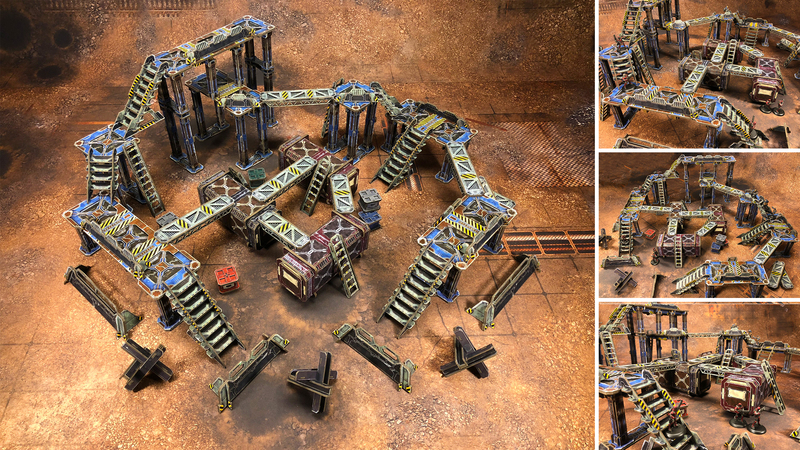 TinkerTurf is a modular terrain system designed to let you start rolling dice sooner at a fraction of the time and cost of existing terrain options. Each component is easily assembled from full color, pre-printed, dense 2mm black game board. 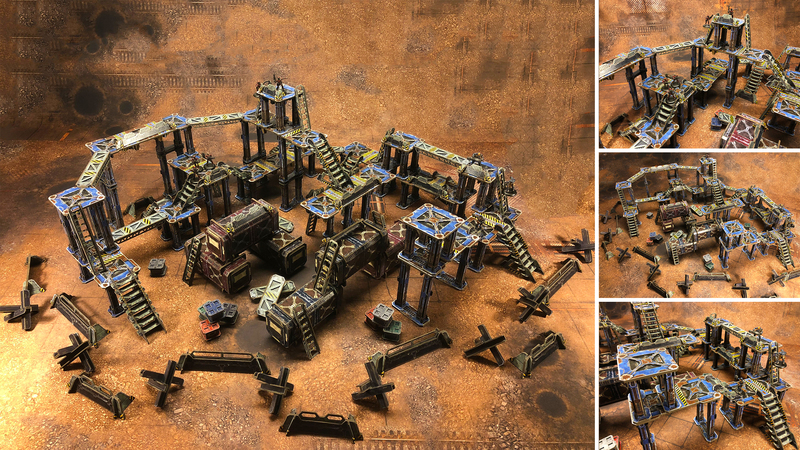 You can build expansive battlefields of great looking, multi-tier structures and cover types for any 28mm and 32mm miniature game. The end result is terrain features of noticeable weight and heft, that will stand up to the demands of many years of hard campaigning. Very easy. You just open the box, pop out the pieces, dab a little glue here and there and assemble the components. Our instructions will be easily accessible on our website where we can make sure they are up to date and fine-tuned. We’re not building a game, but we did create a theme and backstory to build our sets in. We believe even the smallest details mean something in art choices. They give each terrain piece more character individually and together they create a battlefield with a real sense of place. That said, we’re not jamming a story down your throat. We’re very mindful of creating settings that can work well with any of the games we already know and love. To that end, our first setting is the hardscrabble sci-fi world of Gideon's Gate — a formerly prosperous planet on the edge of a vast, fading imperium. Beset by civil war, alien incursions, and the insidious entropy that eventually besets all empires, the imperium is a civilization in ruins. Once the crown jewel of this failed power, Gideon's Gate has become a hotly contested battleground — both for its strategic significance and the rumored wealth of its hidden arsenals. Gideon's Gate is a large world, and we're excited to have you battle in many of it's varied locales over time. We are offering two terrain bundles in the world of Gideon's Gate. 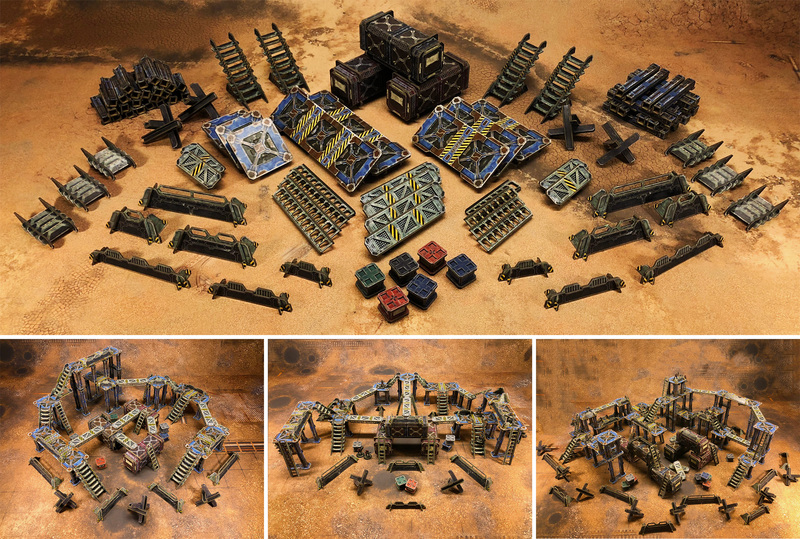 The first terrain bundle in the world of Gideon's Gate is the Sector Meritas Starter Set. With it you can battle across the military industrial landscape of a forgotten supply depot. Add-ons can be added to your pledge once you've made a Skirmish level pledge or higher. They allow you to fine tune the terrain you're getting. Maybe you want more elevation? Maybe you want more cover? Whatever the case, we've got your back. Simply add the appropriate amount to your pledge in USD and the rest will be handled in the pledge manager after the campaign. You can customize your rail depot also! First on the roadmap is new art. Look below for detailed pictures of the sets you can choose from. Maybe you like to fight in a rusted out, decrepit Underhive? Perhaps blasting foes on an unnamed snow planet is your thing? We've got you covered. If we achieve this goal you can select the set you want in the pledge manager after the kick is completed. And we're unlocking this one at the end because you all deserve it! Only for backers that back the MagLev Rail Depot Bundle during the kick. We'll add further stretch goals as we begin to knock these down! We will be charging shipping after the Kickstarter concludes based on the actual costs incurred to ship. We will collect this via our pledge manager after the campaign ends. This is so we can be fair to all our backers as shipping is rarely one size fits all. ASIA: $10 to China and Hong Kong. $30 to most other countries (we can't predict an estimate cost to Malaysia). Unfortunately, different import laws and customs from some specific countries have made it impossible for us to ship the product to them. Be aware that all pledges that are confirmed after the pledge manager deadline will be shipped from the US at a later date. For non-US backers that will likely incur increased shipping costs. We also cannot ship to PO Boxes domestically or internationally. Due to the size of each package there is too great a risk of the package being bounced back to us. Please note that while we do our best to get you your rewards in a timely manner, you may not necessarily receive your rewards before the product makes it into distribution in your own country or before it's made available in conventions and special promotion opportunities. We hope that the special price and exclusive items you will get during the Kickstarter will make up for any such possible lag. However, if this is something that is not acceptable to you, please do not back this project. Thank you for your understanding. We are excited to be partnering with the following companies to make this project a reality once it funds. Our manufacturing partner is Panda Game Manufacturing, an industry leader in producing high-end tabletop products and an amazing company to have in your corner when planning your tabletop related kickstarter. Our fulfillment and shipping partner is Penny Arcade. We would like to thank the following companies for letting us use their stuff. Gorgeous neoprene gaming mats used with generous permission from GameMat.eu! Miniatures for scale used with generous permission from Reaper Miniatures! We're also proud to be hopping on Kicktraq on day 1! We are 99% done with production for the TinkerTurf Sector Meritas starter set. All that remains to be done are simple finicky color and die-cut design modifications. As soon as the kick completes successfully, all that remains is to have Panda Manufacturing begin what we hope will be a larger production run than we anticipate! If we are fortunate enough to complete our stretch goals we will communicate their manufacturing and delivery timelines as well. In some cases they may be added to the base kick, and in some cases they may be new pieces and sets that will be delivered at a different time. The estimated delivery date is September 2018, but keep in mind this is only an estimate. Also, due to the logistics of international shipping, backers in different regions of the world may receive their rewards sooner than others. We've done our best to minimize this as much as possible, and we are always happy to refund pledges if for some totally unforeseen reason the product can't be delivered at all. All refunds after the 14 days close of the campaign may be processed via Paypal. You just want to follow the kick or toss some money in the tip jar. Thanks! DON'T CHOOSE THIS PLEDGE, IT IS MERELY INFORMATIONAL! ADD-ONS: You can add smaller sets to customize your terrain order. See ADD-ONS section in the Campaign page for pledge amount details. REFERRALS: To reward backers for bringing others in we're launching our referral rewards program. To qualify you must have backed at the Skirmish level or higher when the campaign ends. Referral = A person backing at Skirmish level or higher when the campaign ends, and that has left a comment that you referred them. • 1 Referral = 1 FREE ADD-ON OF YOUR CHOICE. • 5 Referrals = 1 FREE SET OF YOUR CHOICE. Referral rewards are cumulative. Every increment of 5 is an additional set. Because of Kickstarter rules we can't give any backer more content than they've personally backed. Rules! Our base bundle with everything you need to start playing out of the box. This set has enough content for a lightly populated 4'x4' battlefield, or a moderately populated multi-level 3'x3' battlefield. Two base bundles to fill out a large battlefield. 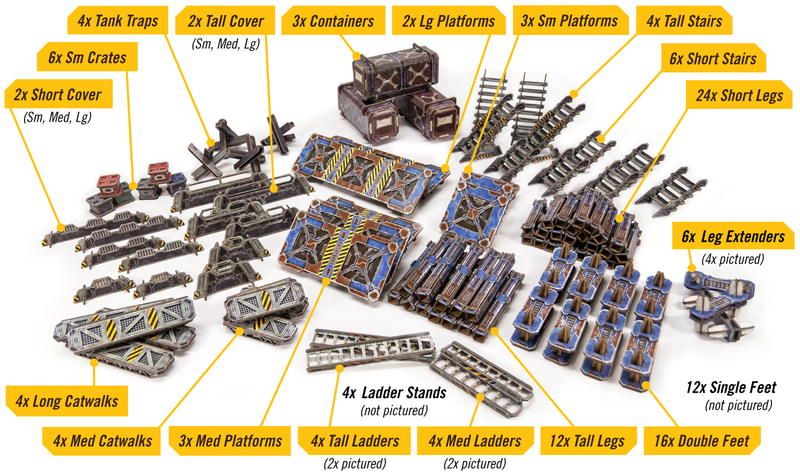 These sets have enough content for a moderately populated multi-level 4'x4' battlefield, or a densely populated multi-level 3'x3' battlefield. NOTE - If you want to buy more sets than 2, merely add an additional $70 per set. After the kickstarter the product will have a $99USD MSRP. This bundle has a cost of $55USD/unit. We will work with retailers to get the lowest shipping possible to their stores for these bulk orders.